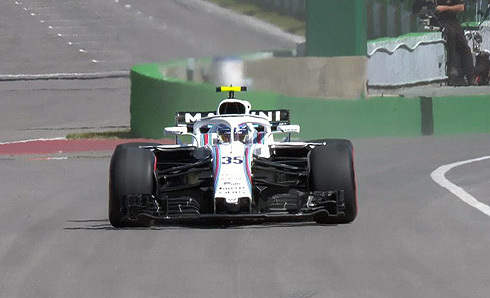 The opening Friday practice sesssion for the 2018 Canadian GP would be another session where both Williams Martini drivers would finish well down the times. Sergey Sirotkin and Lance Stroll would finish in 17th and 18th. Both drivers would focus on runs on the supersoft tyre so there was furthjer pace to be found but both drivers would have moments where they would contact the walls. Sergey would spin off and go backwards into the barrier while Lance would puncture his right rear wheel after making contact with the wall. Hopefully with a move to the softer tyres there will be an improvement in FP2. On what was a very dirty track the opening Friday practice would get underway with everyone completing their installation laps except the Mercedes pair. For this weekend Pirelli had brought the supersoft, ultrasoft and hypersoft tyre. Sergey would go quickest but he was running by himself. Ricciardo would move ahead with a 1m:17.475 followed by Sergey. There was a mix of tyres been used with twenty minutes of the session completed. Ricciardo would improve with a 1m:15.707 but Alonso would go ahead with a 1m:15.240 but on the hypersoft tyre while Ricciardo was on the hypersoft. Alonso would set a 1m:15.006 to remain fastest. Hulkenberg would have a gear changing issue and this would see the Virtual Safety Car deployed. He had lost drive to his Renault stuck at Turn 12. This would be replaced by a red lag. Hulkenberg was not able to resolve his issue and would have his car picked up and return to the pits. With fifty five minutes remaining the order was Alonso, Vandoorne, Bottas, Ricciardo, Hamilton, Sainz, Grosjean, Sergey, Gasly and Raikkonen. The second Williams was in 11th. Both McLaren's were on the hypersoft tyre. With fifty minutes remaining the session would restart. 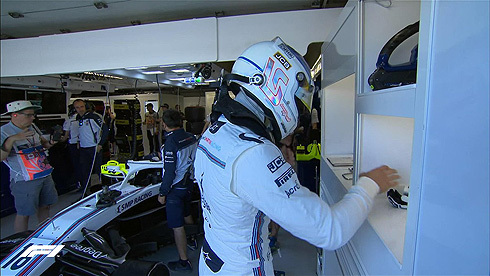 The Williams drivers would drop to 16th and 17th as other drivers set times. At the from Alonso would see Bottas go quickest with a 1m:14.028 but Hamilton would go quicker with a 1m:13.967. Raikkonen was now fifth while for Williams Sergey would improve too be 11th. This would become tenth but he would again drop to 11th. The second Williams was now 17th. Thirty minutes remaining and Verstappen would go quickest on the hypersoft with a 1m:13.389 followed by Hamilton and Bottas. Both Williams drivers were down in 16th and 18th and had yet to change from the supersoft tyre. Verstappen had improved with a 1m:13.302 followed by Hamilton and now Ricciardo. Ten minutes remaining the Williams drivers were in 17th and 18th. But neither driver had gone on to the softer tyres. With the end of the session the order was Verstappen from Hamilton, Ricciardo, Vettel, Bottas, Raikkonen, Alonso, Sainz, Vandoorne and Gasly tenth. For Williams it was a session that saw both drivers have problems making contact with the walls ending in 17th and 18th effectively slowest. But neither driver had moved onto the softer tyres so their pace was based on the supersoft tyre run but despite this it was still a frustrating session. Lance would be seen with a new helmet design for his home race. Lance would also come out for his installation lap on the supersoft tyre. Lance would also return again on the supersoft and his first time was a 1m:17.827 to be fourth dropping to sixth. This would become eighth as other set times. Lance would set a 1m:17.575 and would pit. Lance would return to the track and would set a 1m:16.559 to be 15th. Lance would glance the wall at Turn 4 complaining of the rear of his car. He would drop to 17th. Lance would report that he has a right rear puncture after having made contact at the Wall of Champions. Lance would pit and was now 18th. With his impact with the wall it was more than likely that he would not come back out again. 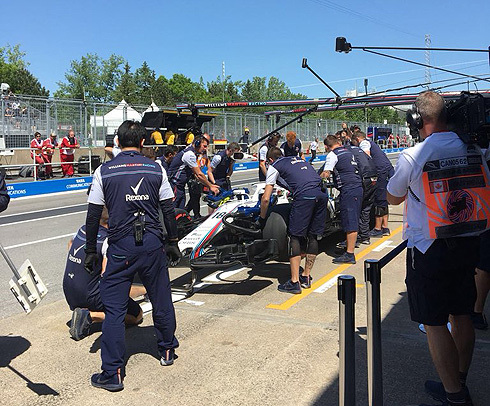 Sergey would take to the track first for Williams running the supersoft tyre. He would pit after a single installation lap. Sergey would be the first driver to return to the circuit for timed laps. He was still on the supersoft tyre and would set a 1m:23.556. Sergey would improve with a 1m:18.798 to be briefly quickest. A 1m:17.395 saw him now third. He would drop to fourth behind Sainz. This would become fifth but with the restart of the session Sergey would quickly drop to 16th with a 1m:17.253. But Sergey would find time after the restart setting a 1m:16.285 to be 11th. With a 1m:15.768 Sergey would move into tenth but again he would drop to 11th. Sergey would drop to 14th and would pit. In the pits he would drop to 16th. Sergey would return still on the supersoft tyre. With five minutes remaining Sergey had completed 16 laps on the supersoft tyre. But Sergey would have a spin and crash at Turn six but was able to get back to the pits ending his session. No doubt he would have some damaged to his car.